The Republic of Karelia (Russian: Респу́блика Каре́лия, tr. Respublika Kareliya, IPA: [rʲɪˈspublʲɪkə kɐˈrʲelʲɪ(j)ə]; Karelian: Karjalan tazavaldu; Finnish: Karjalan tasavalta; Veps: Karjalan Tazovaldkund) is a federal subject of Russia (a republic), located in the northwest of Russia. Its capital is the city of Petrozavodsk. Its population in 2010 was 643,548. The modern Karelian Republic was founded as an autonomous republic within the Russian SFSR by the Resolution of the Presidium of the All-Russian Central Executive Committee (VTsIK) of June 27, 1923, and by the Decree of the VTsIK and the Council of People's Commissars of July 25, 1923, from the Karelian Labor Commune. From 1940 to 1956, it was known as the Karelo-Finnish Soviet Socialist Republic, one of the union republics in the Soviet Union. In 1956, it was once again an autonomous republic and remains as a part of Russia after the dissolution of the Soviet Union in 1991. The republic is in the northwestern part of Russia, between the White and Baltic Seas. The White Sea has a shoreline of 630 kilometers (390 mi). It has an area of 172,400 km2 (66,600 sq mi). It shares internal borders with Murmansk Oblast (north), Arkhangelsk Oblast (east/south-east), Vologda Oblast (south-east/south), and Leningrad Oblast (south/south-west), and it also borders Finland (Kainuu, Lapland, North Karelia, Northern Ostrobothnia and South Karelia); the borders measure 723 km. The main bodies of water next to Karelia are the White Sea (an inlet of the Barents Sea) to the north-east and Lake Onega and Lake Ladoga both shared with neighboring Oblasts to the south. Its highest point is the Nuorunen peak at 576 m (1,890 ft). As a part of the Fennoscandian Shield's ancient Karelian craton, most of the Republic of Karelia's surficial geology is Archaean or Paleoproterozoic, dated up to 3.4 billion years in the Vodlozero block. This area is the largest contiguous Archaean outcrop in Europe and one of the largest in the world. Since deglaciation, the rate of post-glacial rebound in the Republic of Karelia has varied. Since the White Sea connected to the World's oceans uplift along the southern coast of Kandalaksha Gulf has totaled 90 m. In the interval 9,500–5,000 years ago the uplift rate was 9–13 mm/yr. Prior to the Atlantic period uplift rate had decreased to 5–5.5 mm/yr, to then rise briefly before arriving at the present uplift rate is 4 mm/yr. Largest cities of the Republic of Karelia. The Regions of North and South Karelia lie in Finland and the Karelian Republic in Russia. The Karelian Isthmus is now part of Leningrad Oblast. The lakes Ladoga and Onega are located in the south of the republic. The majority of the republic's territory (148,000 km², or 85%) is composed of state forest stock. The total growing stock of timber resources in the forests of all categories and ages is 807 million m³. The mature and over-mature tree stock amounts to 411.8 million m³, of which 375.2 million m³ is coniferous. Fifty useful minerals are found in Karelia, located in more than 400 deposits and ore-bearing layers. Natural resources of the republic include iron ore, diamonds, vanadium, molybdenum, and others. The Republic of Karelia is located in the Atlantic continental climate zone. The average temperature in January is −8.0 °C (17.6 °F) and +16.4 °C (61.5 °F) in July. Average annual precipitation is 500–700 mm. Historically, Karelia was a region to the northwest of Russia, east of present-day Finland, controlled by the Novgorod Republic. 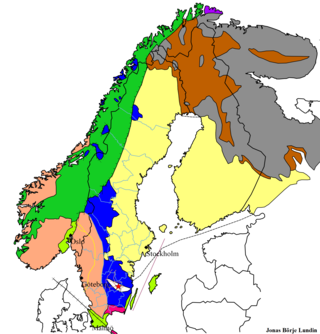 From the 13th century and onwards, various parts were conquered by Sweden, and incorporated into Swedish Karelia until they were lost to Russia by the Treaty of Nystad in 1721. In 1920, the province became the Karelian Labour Commune. In 1923, the province became the Karelian Autonomous Soviet Socialist Republic (Karelian ASSR). From 1940, it was made into the Karelo-Finnish SSR, incorporating the Finnish Democratic Republic which nominally operated in those parts of Finnish Karelia that were occupied by the Soviet Union during the Winter War. 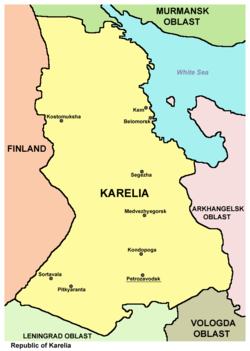 Annexed territories were incorporated into Karelo-Finnish SSR, but after the Continuation War, the Karelian Isthmus was incorporated into the Leningrad Oblast. Its status was changed back to an ASSR in 1956. During the Continuation War in 1941, Finland occupied large parts of the area but was forced to withdraw in 1944. Though Finland is not currently pursuing any measures to reclaim Karelian lands ceded to Russia, the "Karelian Question" remains a topic present in Finnish politics. 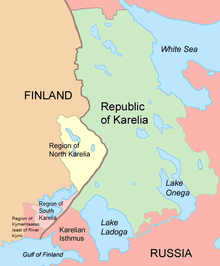 The autonomous Republic of Karelia in its present form was formed on 13 November 1991. Seat of the Legislative Assembly of Karelia. The highest executive authority in the Republic of Karelia is the Head of the Republic. The acting Head of the Republic is Artur Parfenchikov, who was appointed in February 2017. The parliament of the Republic of Karelia is the Legislative Assembly comprising fifty deputies elected for a four-year term. The Constitution of the Republic of Karelia was adopted on February 12, 2001. Population: 643,548 (2010 Census); 645,205 (2002 Census); 791,317 (1989 Census). According to the 2010 Census, ethnic Russians make up 82.2% of the republic's population, ethnic Karelians 7.4%. Other groups include Belarusians (3.8%), Ukrainians (2%), Finns (1.4%), Vepsians (0.5%), and a host of smaller groups, each accounting for less than 0.5% of the total population. 1 25,880 people were registered from administrative databases, and could not declare an ethnicity. It is estimated that the proportion of ethnicities in this group is the same as that of the declared group. Currently Russian is the only official language of the republic. Karelian, Veps, and Finnish are officially recognized languages of the republic since 2004, and their survival is promoted. Finnish was the second official language of Karelia from the Winter War 1940 (annex of Finnish territories) up until the 1980s when perestroika began. Thereafter there were suggestions to raise Karelian as the second official language, but they were repeatedly turned down. The Karelians have traditionally been Russian Orthodox. Lutheranism was brought to the area by the Finnish immigrants during Sweden's conquest of Karelia and was common in regions that then belonged to Finland. Some Lutheran parishes remain in Karelia. 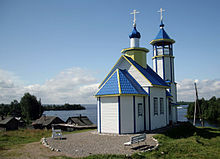 According to a 2012 survey, 27% of the population of Karelia adheres to the Russian Orthodox Church, 2% are unaffiliated Christians, and 1% are members of Protestant churches. In addition, 44% of the population declared to be "spiritual but not religious", 18% is atheist, and 8% follows other religions or did not give an answer to the question. Karelia's gross regional product (GRP) in 2007 was 109.5 billion rubles. This amounts to 151,210 rubles per capita, which is somewhat lower than the national average of 198,817 rubles. The Karelian economy's GRP in 2010 was estimated at 127733.8 million rubles. The largest companies in the region include Karelsky Okatysh (revenues of $1.01 billion in 2017), Segezha Pulp and Paper Mill ($270.83 million), OAO Kondopoga ($140.56 million). Early 20th-century photo of a bridge across the Shuya River. Industrial activity in Karelia is dominated by the forest and wood processing sector. Timber logging is carried out by a large number of small enterprises whereas pulp and paper production is concentrated in five large enterprises, which produce about a quarter of Russia's total output of paper. Three largest companies in the pulp and paper sector in 2001 were: OAO Kondopoga (sales of $209.4 mln in 2001), Segezha Pulp and Paper Mill ($95.7 mln) and OAO Pitkjaranta Pulp Factory ($23.7 mln). In 2007, extractive industries (including extraction of metal ores) amounted to 30% of the republic's industrial output. There are about 53 mining companies in Karelia, employing more than 10,000 people. One of the most important companies in the sector is AO Karelian Pellet, which is the 5th largest of Russia's 25 mining and ore dressing enterprises involved in ore extraction and iron ore concentrate production. Other large companies in the sector were OAO Karelnerud, Mosavtorod State Unitary Enterprise, and Pitkjaranta Mining Directorate State Unitary Enterprise. Processing industries contributed 56,4% of the overall production in 2007. The latter figure includes pulp-and-paper (23.6%), metals and metal-working (7.9%), woodworking (7.1%), foodstuffs (5.8%) and machine-building (3.9%). Production and distribution of electricity, natural gas and water made up 13.6% of the region's output. There is a federal railway (see Murmansk Railway) across Karelia that connects Murmansk Region with St. Petersburg, Moscow, the center of Russia and with Finland. 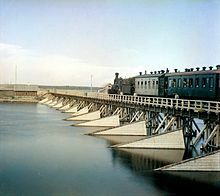 The railroad crosses Petrozavodsk, Kondopoga. Karelia has a relatively well-developed network of transport infrastructure. Water communications connect Karelia with the Barents, Baltic, Black, and Caspian Seas through the system of rivers, lakes, and canals. A federal railway (see Murmansk Railway) and automobile highways cross Karelia and connect Murmansk Region and Murmansk seaport with St. Petersburg, Moscow, the center of Russia and with Finland. Regular airline service connects Petrozavodsk with Joensuu and Helsinki in Finland. A fast fiber-optic cable link connecting Finnish Kuhmo and Karelian Kostomuksha was built in 2007, providing fast telecommunications. The Republic's main export partners in 2001 were Finland (32% of total exports), Germany (7%), Netherlands (7%) and the United Kingdom (6%). Main export products were lumber (over 50%), iron ore pellets (13–15%) paper and cardboard (6–9%) and sawn timber with (5–7%). Many of Karelia's companies have received investments from Finland. Karelia is sometimes called "the songlands" in the Finnish culture, as Karelian poems constitute most of the Karelo-Finnish epic Kalevala. ^ "Карельский государственный архив новейшей истории. Путеводитель". Приложение "Административно-территориальное устройство Республики Карелия". 2003. ^ Romanenko, F.A. ; Shilova, O.S. (2011). "The Postglacial Uplift of the Karelian Coast of the White Sea according to Radiocarbon and Diatom Analyses of LacustrineBoggy Deposits of Kindo Peninsula". Doklady Earth Sciences. 442 (2): 544–548. doi:10.1134/S1028334X12020079. ^ a b c d e "Republic of Karelia". Russia: All Regions Trade & Investment Guide. CTEC Publishing LLC. 2003. ^ "HS in English – HS.fi – Helsingin Sanomat". Helsingin Sanomat. ^ a b c d "The Republic of Karelia in 2007". Helsinki School of Economics. ^ "Regional characteristics. Republic of Karelia". Helsinki School of Economics. ^ "Mining industry of the republic has summed up its work in the first six months of the year". Republic of Karelia. Retrieved August 3, 2009. ^ "The Republic of Karelia". Archived from the original on October 6, 2008. Retrieved April 15, 2009. Wikivoyage has a travel guide for Karelia. Wikimedia Commons has media related to Republic of Karelia.